Cowley College Education majors will continue collecting items through Oct. 23 in advance of the Cowley Clothing Exchange distribution on Oct. 24. Items can be dropped off in rooms 106 and 106A in the basement of Galle-Johnson on the main campus in Arkansas City. The Cowley Clothing Exchange distribution will be held from 1-5 p.m. Saturday, Oct. 24 in the Earle N. Wright Community Room. The event is open to anyone. 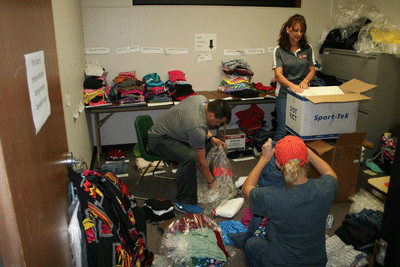 In the past, the event has collected well over 5,000 articles of clothing and shoes and served 200-300 people. Families stand in line several hours to be the first in the door. For more information on how to help with this event, please contact Julie Rhoads at rhoadsj@cowley.edu. Pictured: Cowley College students Ricardo Galvan and Bailee Henry assist Julie Rhoads with sorting items for the Cowley College Clothing Exchange.